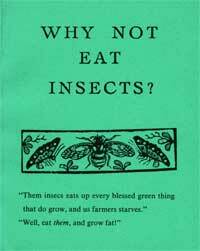 'Them insects eat up every blessed green thing that do grow and us farmers starves' 'Well eat them, and grow fat!' 'Humorous and full of ideas . . , deserves a wide readership,' Simone Sekers, Sunday Telegraph. '. . . both a gem of Victorian idiosyncrasy and a fascinating treatise on human behaviour. In an age of foodism, what is out of bounds? Slug soup, braised beef with caterpillars and moths on toast could yet appear on tomorrow's gastronomic menu'. Country Living. 'My Congratulations to Pryor Publications for keeping this little classic in print so that more generations can be entertained, enthralled and educated.' David Bellamy. 13.0cm x 10.5cm. 104 Pages. Paperback. ISBN: 978 0 946014 125.